Wer verzweifelt nach dem Jadepanther in seiner Reittierliste sucht, sollte sich mal unter Smaragdpanther umsehen. Offenbar gibt es hier einen Übersetzungsfehler. One of the new craftable mounts by jewelcrafters, the other ones being Sonnensteinpanther, Saphirpanther and Rubinpanther. Mix them all together and you'll get Juwelenbesetzter Onyxpanther. OBVIOUSLY, Something Expensive is a PLACEHOLDER to make those, it will change as the beta going further and further. This is one of the new Mists of Pandaria BoE mounts crafted by Jewelcrafters. It will likely require the Jewelcrafter to reach level 600 in the profession and will cost Kugel der Geheimnisse x5 (which cost 100,000g each). This is one of the new Mists of Pandaria BoE mounts crafted by Jewelcrafters. It will likely require the Jewelcrafter to reach level 600 in the profession. and will cost Kugel der Geheimnisse x5 (which cost 100,000g each if only sold by vendors). Why does a jade panther have a purple icon? Sold that one for 40.000 gold on the auction house. Tried to sell it for double price but no one wanted it. Since the orb alone costs 20.000 gold, don't expect to make much profit with this one... most people have their own jewelcrafter or a guild jewel crafter... and getting the recipt isn't that much of a problem. 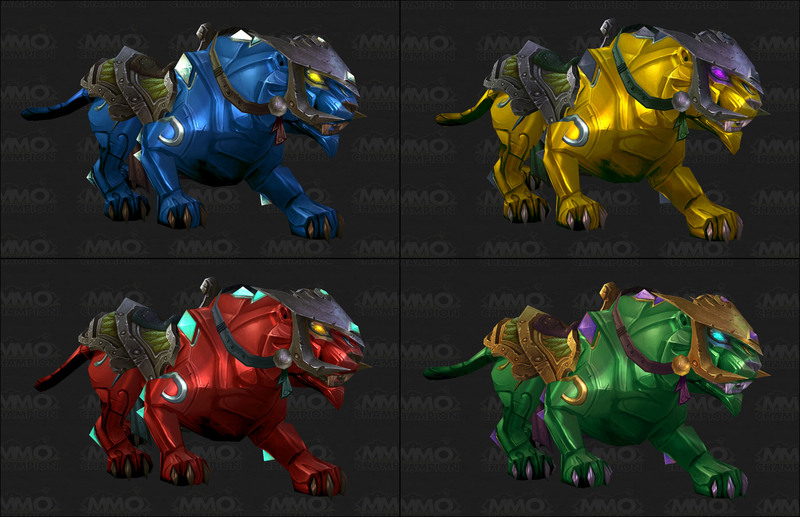 It's called "Jade Panther", but once you use it, you will find it in your mount list under "Emerald Panther". This is just a heads up, as it can be a pain to track down for people with extensive garages. Blizzard should implement a search feature in the mount list like they have for vanity/battle pets. By the Power of Greyskull I have the Power - Definetly reminds me of He-Man's Tiger. This may be a little off topic, but since this is a created mount (like Vial of Sands) and you want to give your guild some extra motivation to down raids or if your having problems at a certain raid boss, I recommend using these mounts. Offer it as a reward to the group that downs that raid or boss. We do it as a drawing for two reasons, 1 we cant all afford a bunch of orbs lol and 2) makes the guildies want to try again for it. This recipe can be bought for 200g from San Redscale, once you are Revered with The Order of the Cloud Serpent. This is just one of the new amazing Jewelcrafting mounts. How the **** does a jeweled panther even FLY? so last night i saw a jade pather on AH for 9k gold. but im poor so i culdnt afford it. so i told my friend that it was on AH if he like it. (since his very rich) then this morning when i was just about to do some daily's i saw a mail icon. when i opened it was a jade panther from my friend! he bought it for me. how awesome is that? I created a simple video a while back showing how too easily rep up and obtain the recipes, also showing all the mats needed to create all 5 of the panthers. "Legenden zufolge hat ein uralter pandarischer Kaiser den ersten juwelenbesetzten Panther für seinen Sohn gefertigt, nachdem dessen Zwillingsbruder einer Krankheit erlag."